Aulia: Alessio and I met each other through a dating app back in 2015. It was my first time on a dating app and I was nervous about it. Alessio happened to be the first person that I matched with and we struck up a conversation! Alessio was staying in Switzerland and I am based in Singapore. After two months worth of conversations, we took the leap of faith and went on a trip together to Zurich. We met in the Spring 2015, and by the shores of Lake Zurich, we decided that we did not want to be apart any longer. In June 2015, Alessio officially moved to Singapore. He has always wanted to live and work in Asia, and it was as if we were pre-destined to be together. Ever since, we have called Singapore our home and are looking forward to starting our new life together here. Alessio is Italian from Cima, Porlezza Italy and I am a Singaporean with mixed cultural roots – my mother is from Singapore and father from Indonesia. Our characters are very similar. We are crazy and passionate people, and we love whole-heartedly. We share similar taste in music, and a wild, childish enthusiasm for theme parks and roller coasters – our dream to visit all the Disneyland and Universal Studios theme parks in the world! 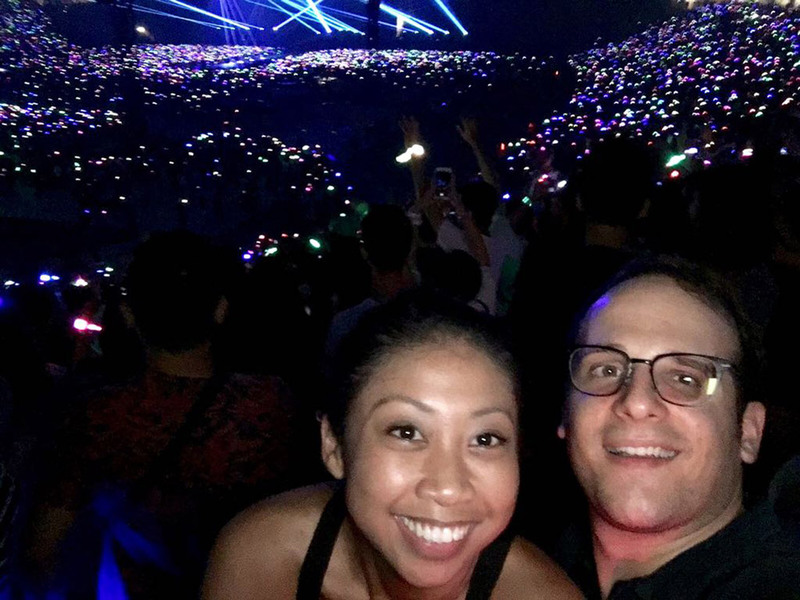 Aulia: Alessio popped the question at the Cold Play – Head Full of Dreams concert on 31 March, 2016. He proposed during my favourite song, The Scientist. I had no clue about what was going on as I was absolutely excited to see Chris Martin! It was the concert of a lifetime that we have been anticipating for months – Alessio has definitely chosen the right moment to propose. Days after the proposal, I learned that Alessio had been planning for it for some time. In fact, he had been in touch with the band manager and event organisers, asking them if Cold Play can assist with the proposal. However, the manager respectfully declined and offered his blessings with an original signed poster from the band – it was very sweet of them. 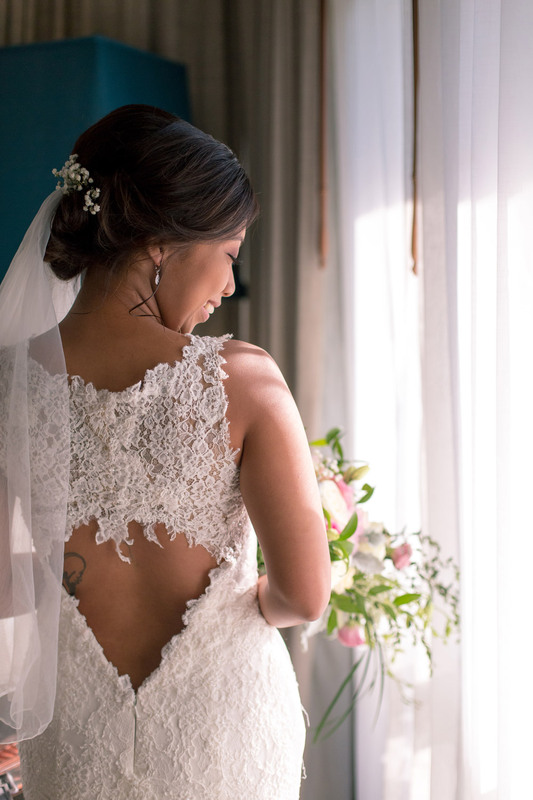 Aulia: I had chosen Lacebridge, a specialist in bespoke wedding gowns and had worked with Sharon from the boutique. The mermaid-cut dress is inspired by the beach and features off-white premium embroidered lace and satin to complement my tanned skin. To incorporate the island vibes, the bottom of the dress and train showcase a wave-like effect that mimics the waves of Koh Samui. 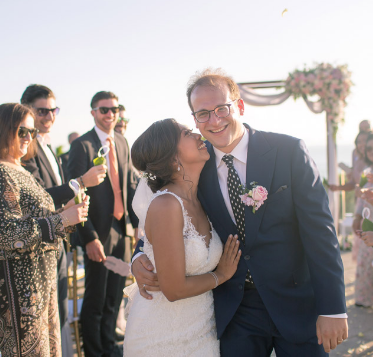 The dress is also lightweight in nature and can be easily packed into my suitcase – the perfect wedding gown for the outdoor ceremony. The gown is also pegged at the affordable price of $2,800. 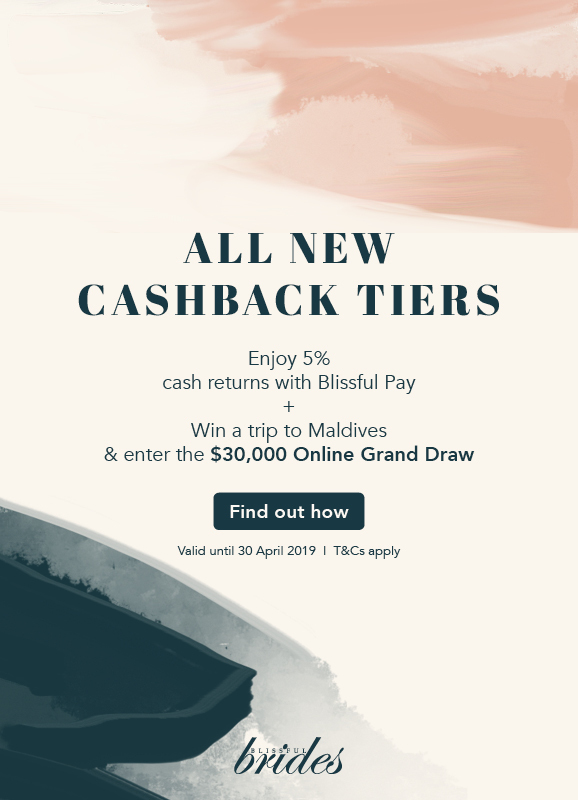 Aulia: We have always loved Thailand and its beautiful beaches. 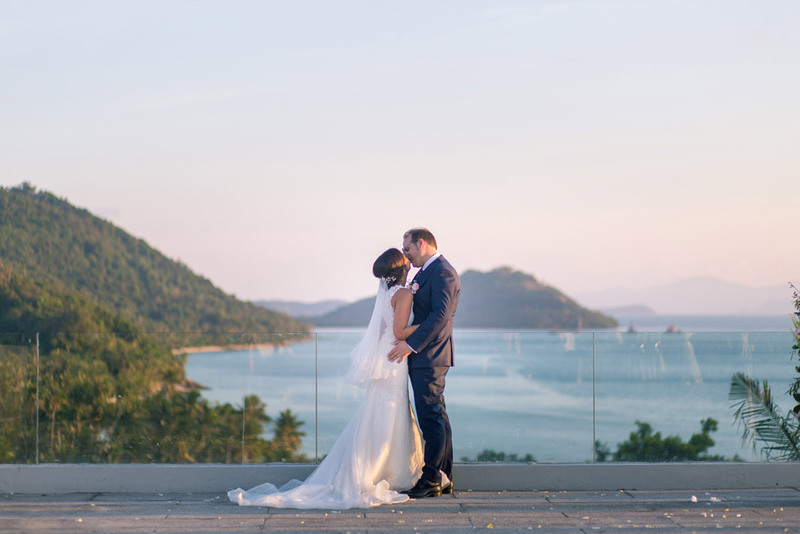 Alessio has been to Koh Samui twice and fell in love with the island. We thought of it as the perfect place for an island destination wedding destination and an unforgettable getaway for our friends and family. We held our wedding ceremony at Azure Lounge, which happened to overlook the sea. The view was stunning with the view of the islands, blue sky and ocean. 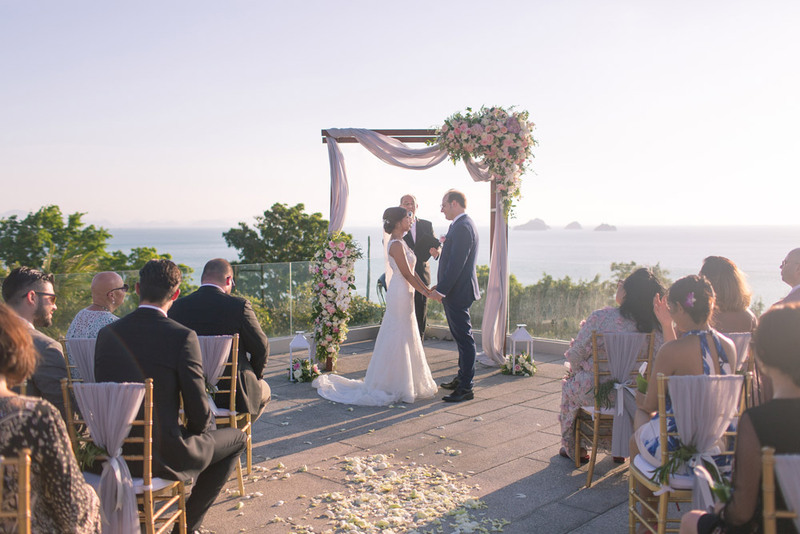 The ceremony had started at 5.30pm – the perfect time for an incredible sunset view. For the theme, we had decided on a classic pastel grey colour theme that was complement by fresh white and light pink flowers. Gold Tiffany wedding chairs with white cushions then tied the wedding theme together. A sunset canapé was hosted at the Air Bar just after the ceremony for our guests to enjoy refreshments and to take photos with the backdrop of the gorgeous sunset. The dinner reception was held at the beach, where we had wanted our guests to kick off their shoes, relax and dance the night away. The setting was exquisite and had featured fine table settings and a gazebo that was adorned with fairy lights. A sumptuous three-course dinner with a selection of local or western dishes was prepared by Chef Gilbert and we were serenaded by a live band as we dined and dance under the stars. We were told by our guests that the had a great time, and most made heartfelt speeches during dinner to express their gratitude, blessings and love for us. They also felt that the wedding was very well-organised. Aulia: Every moment was beautiful. We did do our best to keep some parts of the wedding a surprise for each other. This is especially so for our outfits, where Alessio and I did not know what either of us was wearing. 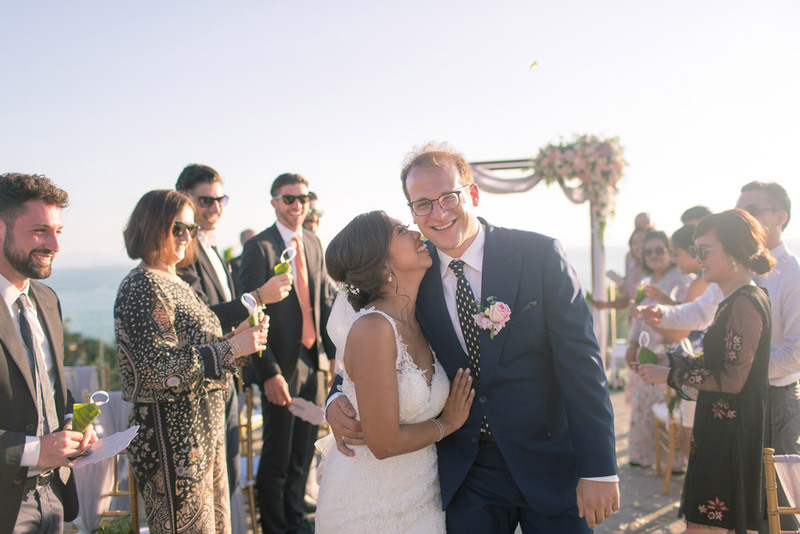 When the moment arrived and we saw each other during the ceremony, we were both just blown away – he was so handsome!